I’ve wanted to make this for a LONG time and in this cold, bleak weather it was just calling my name! I deviated slightly from a traditional pot pie recipe in that I topped the pie with a big biscuit rather than using a pie crust. 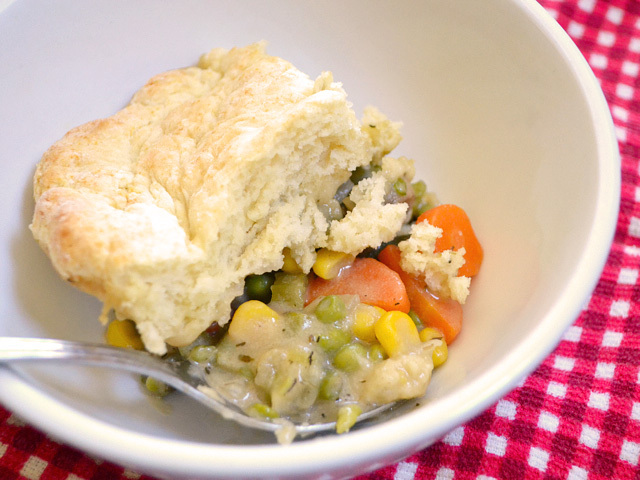 I liked the idea of having a fluffy biscuit to soak up the flavorful filling. It didn’t disappoint. The ingredient list is long for this recipe because I used mostly fresh vegetables. 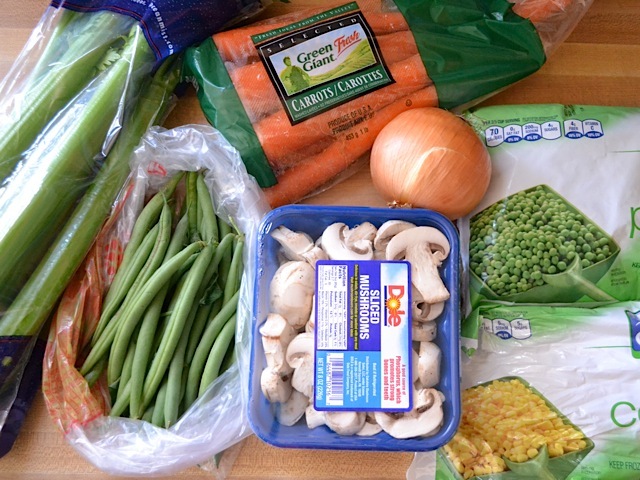 If you want to cut down on prep time, you can certainly use a bag of mixed frozen vegetables. I won’t look down on you. Frozen vegetables are my best friend. I probably would have used them too, but I knew I was going to need carrots and celery for some other recipes this week, so I went ahead and bought them. 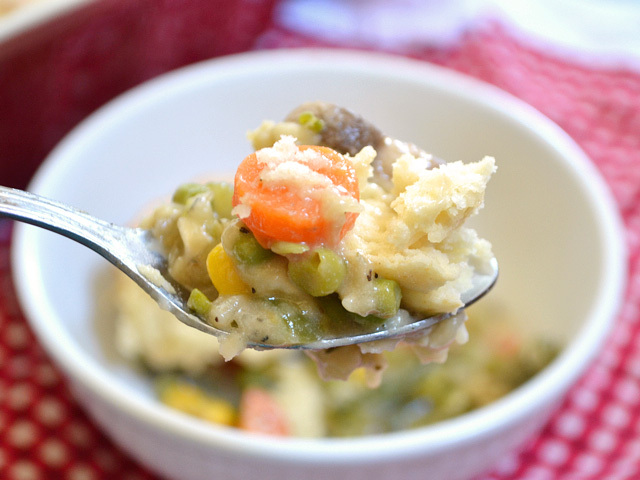 If you wanted to make this into a chicken pot pie, it would be super simple. Just get a rotisserie chicken, pick the meat off, and mix it in. Or cut up a chicken breast into small pieces, saute it up really quick in a skillet, and then add it in. Very easy. Once you get through the chopping, this recipe is a breeze! 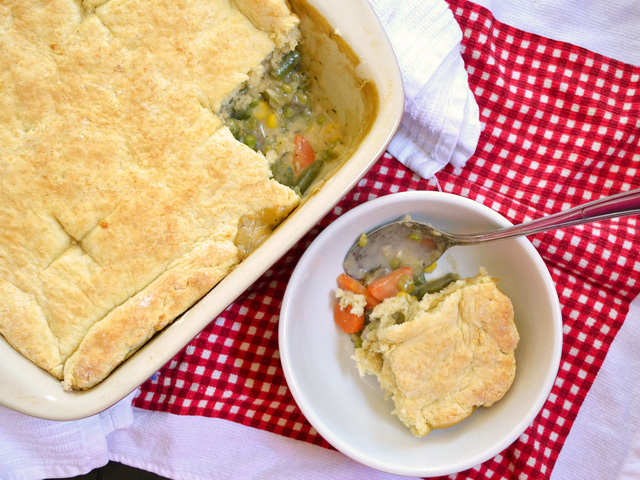 A vegetable pot pie with a homestyle biscuit topping. Before you begin cooking, prepare all of the vegetables. Mince the garlic, dice the onion, chop the celery into small pieces, peel and slice the carrot, and break the green beans into one inch sections. If your mushrooms aren’t pre-sliced, go ahead and slice them. 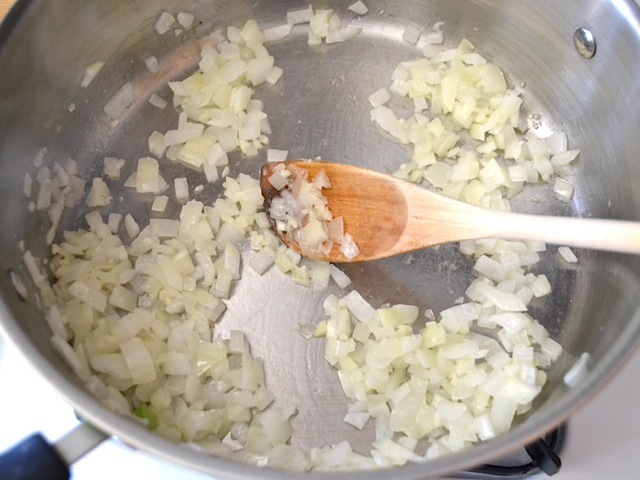 Add the vegetable oil, onion, and garlic to a large pot. Saute over medium heat until the onions have softened. 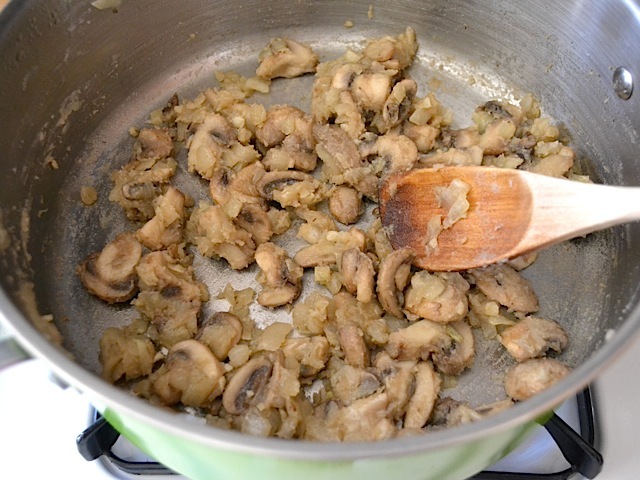 Add the mushrooms and continue to saute until the mushrooms have released all of their moisture, become limp, and turned dark tan in color. Melt the butter into the pot. Once the butter has melted, add the flour. Stir and cook this mixture for about three minutes. It’s okay if the flour begins to coat the bottom of the pot, but if it looks like it may begin to burn, turn off the heat. Warm the vegetable broth slightly in the microwave. Add the broth to the pot and stir to dissolve all of the flour off of the bottom of the pot and off of the vegetables. Warm the milk in the microwave. Slowly add the milk while stirring. Add the rest of the vegetables (green beans, carrots, celery, corn, peas) and the thyme. Increase the heat and bring the pot up to a simmer. Once it reaches a simmer, reduce the heat to medium-low and allow it to simmer for 10-15 minutes while you prepare the biscuit dough. Stir the mixture occasionally to prevent it from scorching on the bottom of the pot. Preheat the oven to 450 degrees. 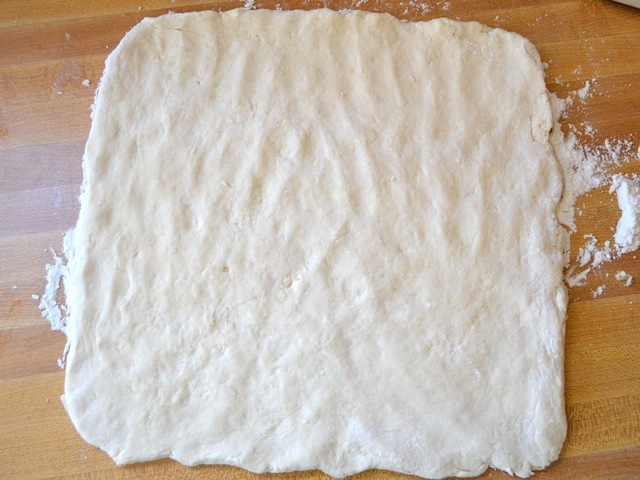 While the vegetables are cooking, prepare a basic biscuit dough. The recipe and step by step instructions can be found here. This will only take about 10 minutes. 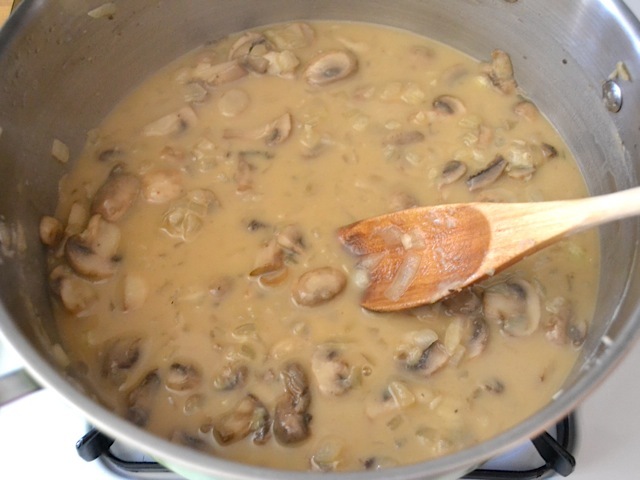 After simmering for 10-15 minutes, the liquid in the pot should have reduced and thickened. If you’d like it thicker, you can sprinkle in about a teaspoon of cornstarch and stir until thickened. Give it a taste and add salt and pepper to your liking (I added about 3/4 tsp of salt). 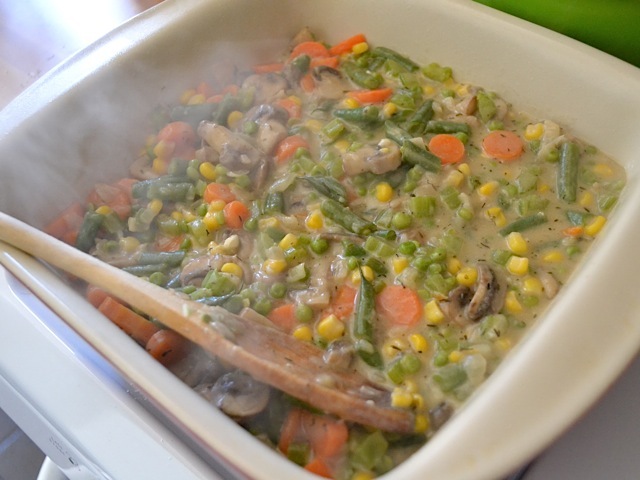 Pour the vegetable mixture in the bottom of an 8×8 inch casserole dish. 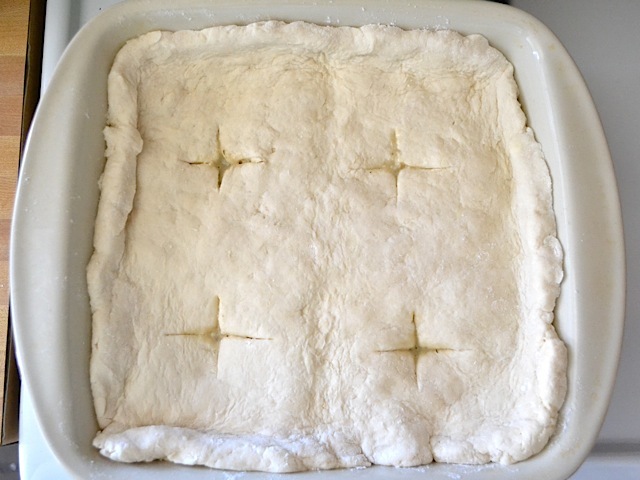 Turn the biscuit dough out onto a floured surface and shape it into a large square, approximately the same size and shape as the casserole dish. Transfer the biscuit dough to top the vegetables in the dish. Use a sharp knife to cut a few slits in the biscuit dough to allow steam to escape. Bake the dish in the preheated oven for 15-17 minutes or until the biscuit is golden brown on top. So these are the vegetables that I used. Had I not had plans for the rest of those carrots and celery, I probably would have bought a bagged mix of vegetables. Sometimes it’s not worth it if you know you can’t use up the leftovers. Get all of the veggies prepared before you begin cooking. 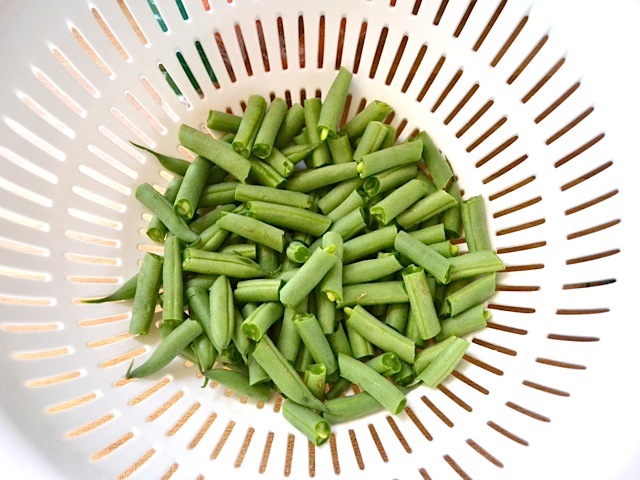 Snap the green beans into one inch sections and give them a good rinse under cool water. 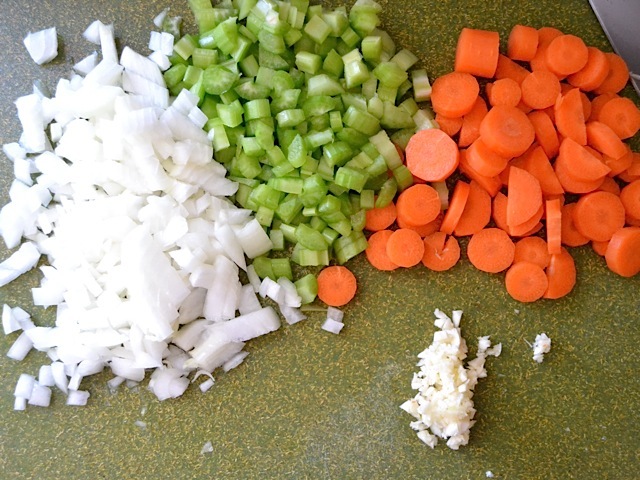 Dice the onion, chop the celery, and slice the carrots. Mince the garlic. Get the onion and garlic going first. Cook them in 1 Tbsp of vegetable oil over medium heat until they’re soft. 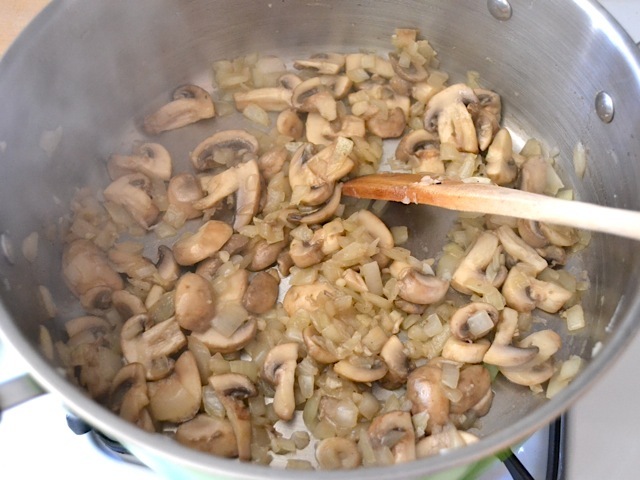 Then add the mushrooms and cook those down until they’re soft. They might seem dry at first but then they’ll suddenly start releasing all of their moisture and get limp. 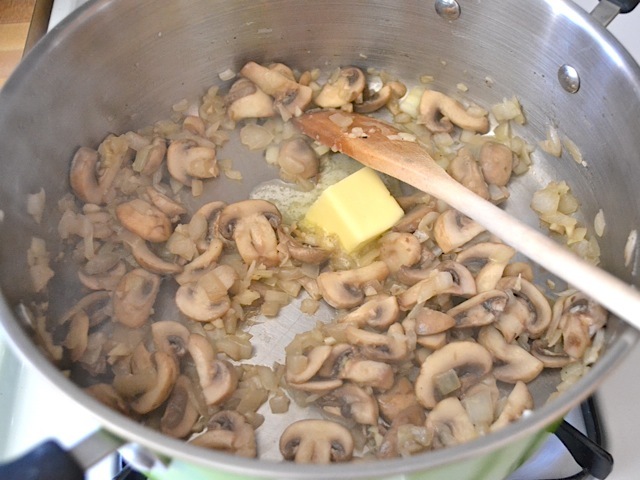 Once the mushrooms have softened, add the butter and let it melt in. Then add the flour. Stir and cook the pot for about 3 minutes to give the flour time to slightly toast. This will prevent a floury flavor in the final product. It’s okay if it starts to stick to the bottom of the pot, just don’t let it burn. Warm the broth up slightly in the microwave and then add it to the pot. 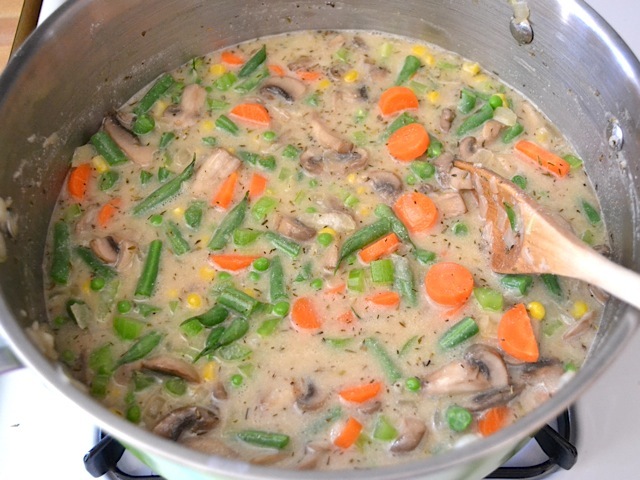 Stir well to dissolve all of the flour off of the bottom of the pot and the vegetables. Warm the milk up too. Add it slowly as you stir the pot. If you dump the milk in cold and all at once, it may curdle. If it *does* curdle, it’s not a complete loss (mine did a little). That just means that the proteins seized up, not that the milk is spoiled, and by the time the whole thing is done, you won’t even see it. Also add the rest of your vegetables and the thyme. Let this mixture simmer for 10-15 minutes while you make the biscuit dough. Start preheating the oven to 450 degrees. 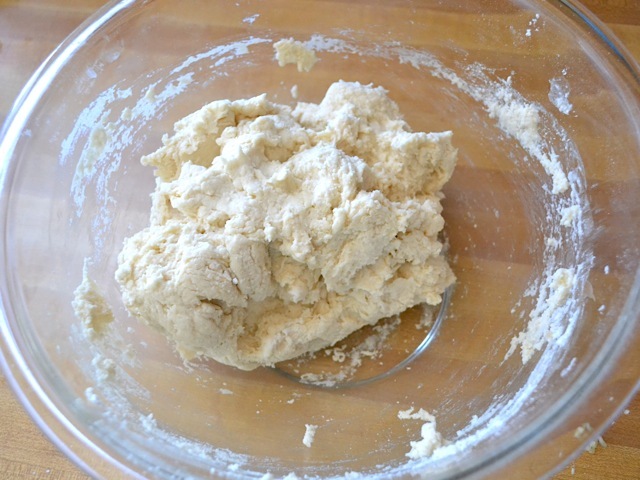 Make a basic biscuit dough, like this one. It’s easy and only takes about 10 minutes. After the veggie mix has simmered for a while, give it a taste and add salt and pepper to your liking. I added about 3/4 teaspoon of salt and a few cranks of the pepper mill. If you mixture hasn’t thickened to your liking, you can sprinkle in a teaspoon or so of corn starch and stir until it thickens up. Pour the veggie mix in the bottom of an 8×8 casserole dish. Turn the biscuit dough out onto a floured surface and shape it into a square roughly the same size as your casserole dish. Transfer the dough to the top of the vegetables in the casserole dish (mine was just a smidge too big). Cut a few slits in the top to allow steam to escape. 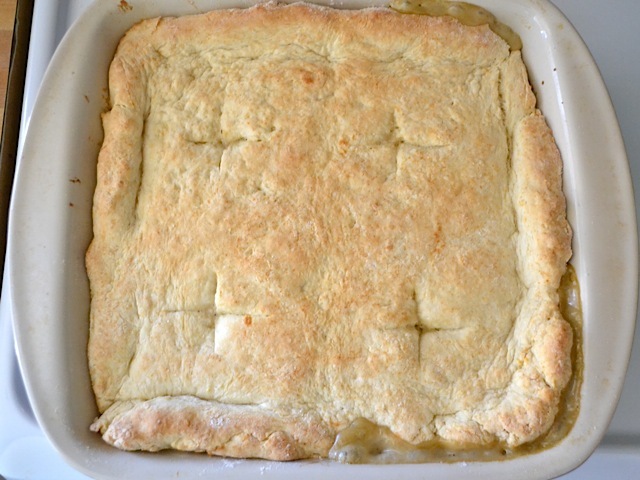 Bake the pot pie in the fully preheated oven for 15-17 minutes or until it is golden brown on top. I really enjoyed the recipe, thank you! But the link to the biscuit actually went to the pumpkin recipe roundup from 2012! Love this one! I used my Dutch oven as another poster suggested. Veganized it with almond milk and vegan margarine. The gravy was perfect consistency! Another winner! I used a 1 lb bag of frozen mixed vegetables (didn’t even thaw), in addition to some sauteed mushrooms that were in my freezer. I added some leftover turkey breast and used 1/2 teaspoon thyme and 1/2 teaspoon poultry seasoning. I agree with another reviewer who felt that 1 teaspoon of thyme overwhelmed the dish the first time I made it. The dough for the biscuit topping was very sticky and difficult to shape, so this time i just dumped the dough on top of the filling and smoothed it out a bit with a spatula. Perfection! Thanks to you, my husband’s co-workers think I’m a great cook. Is this recipe good leftover? Would freezing or refrigerating and eating over the course of a few days be okay? I had one suggestion for the step by step pictures, it would be very helpful if the ingredient amounts were put in the paragraphs between the photos so I wouldn’t have to scroll up to the top each time. Just a thought. Oh and it seemed like adding the thyme overpowered the whole dish, anyone else notice this? Hi! I want to make this for a potluck, and I wanted to know if you had any make-ahead tips for this recipe. Would it be better to make the veggie mix and refrigerate until I can make the biscuits? I’m a poor college student, so I love recipes that I can make on Sunday nights and eat leftovers for at least a few days a week (and freeze the rest for quick meals later on!). And this was an excellent recipe! I bulked it up by stirring in some cooked brown rice to the vegetable mixture before popping the whole thing into a dish to bake. I used a package of “Ps$t!” brand biscuits to cover the top because I didn’t have the materials on hand to make your biscuit recipe and it worked just fine! It was so good! 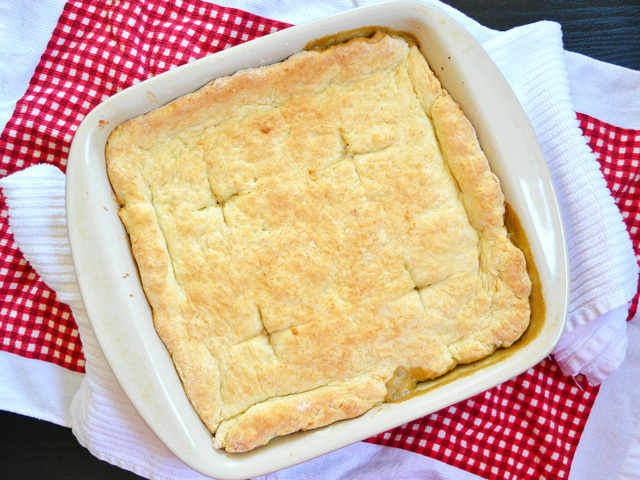 On a gold winter night like this, a hearty pot-pie was just what the doctor ordered! I will definitely be making this again. Thank you so much for posting it! OMG!!!! You are a Godess!! Amazing reciepe!! I struggle to cook!! Today I cooked this & the teriyaki bowel for lunch!! Both dishes turned out amazing!!! I try to budget my nightly dinners at $6, as I am a poor single mom of 2 teens. We are vegetarians and you have sooo many veg reciepes too!! THANK YOU!! I made this last night in my Dutch oven so I could throw it from the stove to the oven in one pot. I added some Sriracha to the veggies and used Bisquik I had on hand (plus some rosemary) for the biscuit topping. As usual, awesome!